It's time to lace up your design boots, step into the squared circle, and SHOCK THE WORLD with your finest wrestling-themed projects! Welcome to the GAME SLAM! 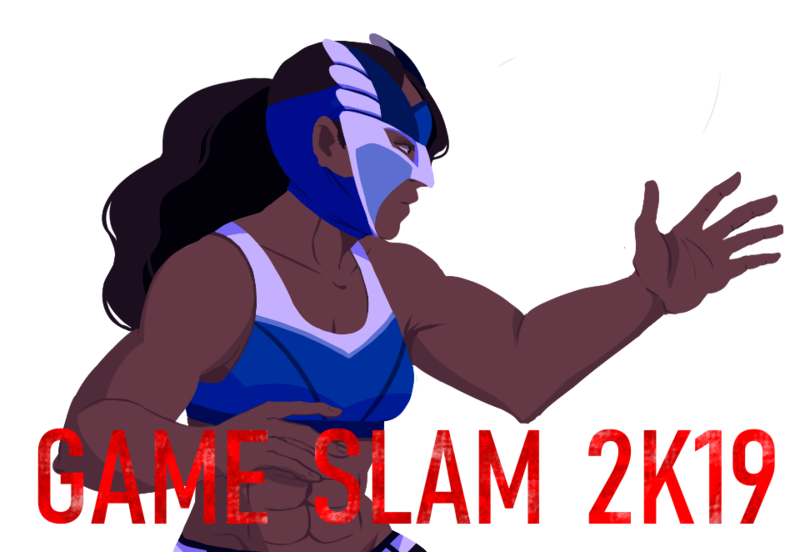 This is a game jam about the world of Pro Wrestling--both the battles on-screen and off. The fights. The politics. The drama. The comedy (intentional and occasionally otherwise). The stories that stay with us for a lifetime. From the massive arenas to the tiniest little indie venues, wrestling owns, and this game jam is our way to show our love for this strange, perfect art form. The rules are simple: Make a game (tabletop, video, text, or otherwise) that tells a story about professional wrestling or professional wrestlers (on-screen or otherwise)! And remember--this time, we're going full force! Note: We, the makers of this game jam are committed to making and maintaining an inclusive, welcoming space for gamers of all types. To that end, racism, sexism, transphobia, homophobia, ableism, and other related material is unwelcome. What types of games are permitted? While the Game Slam was launched with tabletop RPGs and LARPs in mind, any type of game is welcome. If you want to make a text-based pro wrestling adventure, or a wrestling platformer, go ahead! Are previously published/created assets allowed? Of course! Several designers are polishing/expanding games they’ve published previously. Can I charge for my game? Am I expected to charge for my game? You have complete control over the pricing of your game. If you want to release it for free, go ahead; if you want to charge for it, go ahead. If you charge for it, I encourage you to consider ways to make the game available for people who can’t afford the price (a plain text file version for free is a popular option). But it’s entirely your decision. There is no competition aspect to the Game Slam; it is just for the love of the game. Feedback can be requested and given at the discretion of the individual designer, and should be noted on the individual game page. I missed the deadline! Can I still submit my game? “Stone Cold” Steve Austin showed up late for work every single day of his career, and is one of the biggest stars in wrestling history. Shoot me an email (jeffstormer@gmail.com), and we’ll get your game added to the page. Learn how to cut a promo! A storytelling game about a tag team on the verge of either break up or success. A one page RPG for one player about the bravest wrestler of all time and his t shirt.